When it comes to MMA in the UK, one name is synonymous with the quickly growing sport more than any other – Michael ‘The Count’ Bisping. The winner of season 3 of The Ultimate Fighter back in 2006, Bisping was the man that the UFC built their push into the UK around, and over a long and storied career that saw him step into the Octagon a remarkable 29 times, he eventually became the first British fighter to ever win a UFC title in 2016. 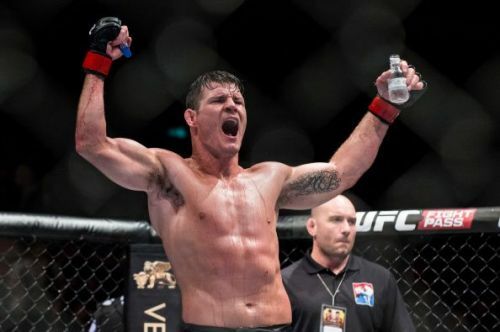 Now retired following back-to-back losses to Georges St-Pierre and Kelvin Gastelum – as well as a string of injuries – Bisping primarily acts as an ambassador and analyst for the promotion, but in terms of UK MMA, his shadow still looms large over any young fighter looking for UFC success. Here are Bisping’s 5 most memorable fights in the UFC. A 2007 loss to Rashad Evans led to Bisping dropping from 205lbs to a more natural 185lbs, and he saw immediate success in early 2008, stopping Charles McCarthy and Jason Day in devastating fashion. Those two wins set up a major fight with another TUF alumni in Chris Leben, and the fight was booked for UFC 89 in Birmingham, England – making Bisping the first native headliner for a UFC show in the UK. 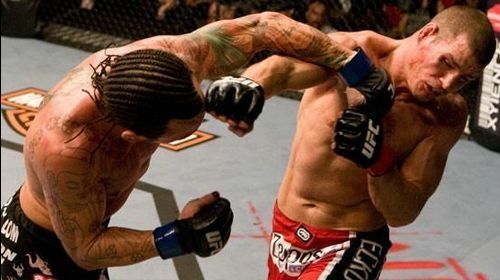 The punching power and iron chin of ‘The Crippler’ made him sound like somewhat of a bad fight for Bisping on paper, but it turned out to be anything but. Leben came in fired up after talking a lot of trash in the build-up – making him the most hated man in Birmingham for the night – and unbeknownst to Bisping, he was also steroid-fuelled, as he tested positive for stanozolol in the post-fight test. But Bisping was determined to make this his night, and a gameplan of using his quick footwork, movement and in-and-out striking style worked perfectly. Despite throwing heavy counters and coming close to landing at times, Leben simply couldn’t catch Bisping with the big shot and ended up being picked apart, Bisping cutting his face to shreds with combinations and leaving him a bloody mess. In the end, it was a one-sided but highly memorable fight, as Leben didn’t stop coming forward – eventually endearing himself to the UK crowd – but was outclassed by Bisping, who showed his elite-level abilities for the full 15 minutes, picking up a unanimous decision. At the time, Leben claimed it was his favourite ever fight, but that felt a little hard to believe.